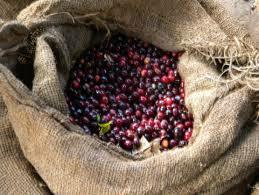 Coffee is said to have gotten its name from the Ethiopian region of Kaffa, where this coffee is produced. Like other coffees from this region the beans produce a rather heavy bodied cup with wine-like aftertaste. 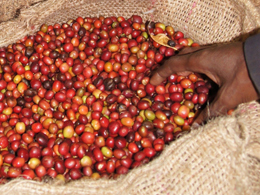 Region: The bulk of Ethiopia's natural coffee exports come from Djimmah. Often used in blends, it commands a premium over other African unwashed Arabicas due to its clean cup and good flavour. The bulk of Djimmah coffee comes from the Illubabor region which has an altitude of 1750 to 2000 m and is about 600 kms from Addis. One of the world's most prized coffees, Harrar has a medium to light acidity, full body with typical mocha flavor and a winey aftertaste. Of the two varieties, Short Berry and Long Berry, the latter is considered the most desirable. All Harrar is dry processed and the beans are slightly yellowish green. Region: Famed the world over for its distinctive blueberry mocha flavour, Harrar coffee fetches some of the highest prices for unwashed coffee in the world market. A good proportion of the crop goes to the Middle East and Japan. The distinctive 'long berry' bean shape is increasingly hard to find, but the cup remains consistently excellent. Coffee in Harrar is not washed due to a marked lack of water resources and the fact that the sundried coffee already fetches significant premiums due to its exceptional cup characteristics. Characterized by its winey aftertaste, this washed coffee delivers a vibrant, balanced cup with sharp acidity and a classic balanced taste. Region: Regarded as secondary to Sidamo and Yirgacheffe, Limu washed coffee still has a distinctive winey flavour. The Limu bean is flatter than the other washed coffees. Although predominantly a smallholder produced coffee, there are some government-owned plantations in Limu. CUP A well balanced cup. Medium acidity and body with a distinct winey flavour. Typically used in blends, this coffee is characterized by a fruity flavor and bright acidity. Beans are processed by both the dry and wet methods. Region: In the west of the country, this area produces a full and fruity coffee, used by many to bring added character to blends. Lekempti is the capital city and also the trade name the coffee is exported as, but in actuality the bulk of Lekempti coffee comes from the Gimbi region and beyond, a good 100 km from Lekempti city. Considered the finest of all coffees grown in the Horn of Africa, the most prevalent taste characteristic is lemon, which gives a distinct tart bite combined with a rich, floral finish. Region: The Yirgacheffe region lies as an island in the middle of Sidamo. It was recognized as a distinct region in the 1960's and set apart for the exceptional citrus and floral flavours found in its washed coffees. Popular among the specialty trade, the beans are processed by either dry or wet methods. The beans produce flavor notes with a spicy character and round, balanced acidity in the cup. Region: With altitudes of up to 2,200 meters, Sidamo produces fine washed and exceptional unwashed coffees. Farmers hold some production as natural to spread their income through the year as red cherries for washed coffees do not keep long if stored. For those visiting this region, we highly recommend staying at the Aregash Lodge near Yirgalem where visitors can see a range of wildlife and also the lodge's own coffee plantation. Used in blends, this coffee contributes to a good balanced cup and enhances the wild characteristic of Ethiopian coffees. Region: In the far south-west of the country, are found the government owned coffee plantations of Teppi/Bebeka. The production from Teppi/bebeka is less well known on the world market than other Ethiopian coffees. With a limited production, these coffees still offer opportunities for those looking for a well-balanced cup, with a distinct 'wild' Ethiopian flavour. A large privately owned plantation has been started in Teppi and sells its coffee as Gamadro with an annual production of 700-800 tons. Pungent in flavor, this coffee is used in blends, resulting in a balanced, full bodied, hearty flavor.